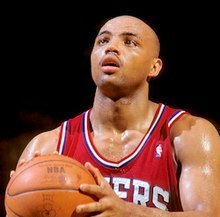 Since retiring as a player, Barkley has had a successful career as an NBA analyst . He works with Turner Network Television (TNT) alongside of Shaquille O'Neal, Kenny Smith, and Ernie Johnson as a studio pundit for its coverage of NBA games and is a spokesman for CDW. In addition, Barkley has written several books and has shown an interest in politics; in October 2008, he announced that he would run for Governor of Alabama in 2014, but he changed his mind in 2010. On March 26, 1991, during a game in New Jersey, Barkley attempted to spit on a fan that had been allegedly heckling with racial slurs but the result was his spit hitting a little girl. 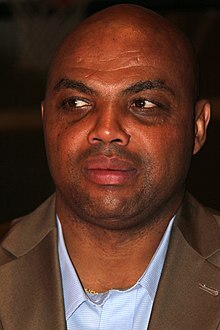 Rod Thorn, the NBA's president of operations at the time, suspended Barkley, without pay, for one game and fined him $10,000 for spitting and verbally abusing the fan. It became a national story and Barkley was vilified for it. Barkley, however, eventually developed a friendship with the girl and her family. He apologized and, among other things, provided them tickets to future games. ^ Duffy, Thomas. "'Inside the NBA' Crew Pours Champagne on Charles Barkley for Winning Sports Emmy". Bleacher Report. Retrieved March 3, 2019. ^ Dorsey, Jesse. "Charles Barkley Wins an Emmy for Sports Commentary on Inside the NBA". Bleacher Report. Retrieved March 3, 2019. ^ "Why Charles Barkley re-signed with Inside the NBA; more Media Circus". SI.com. Retrieved April 1, 2019. ^ "Charles Barkley on when he'll retire: 'I am looking at 60 as the end'". For The Win. March 23, 2018. Retrieved April 1, 2019. ^ Lance Armstrong (January 24, 2019). "The Forward" (Podcast). Event occurs at 1:12:18. Retrieved April 10, 2019. ^ Lance Armstrong (January 24, 2019). "The Forward" (Podcast). Event occurs at 1:15:30. Retrieved April 10, 2019.